Max Frisch's 1953 farce about appeasement does not quite click in a modern milieu. Aurora Theatre's attempt to shuttle a 1953 viewpoint to the present comes off awkwardly. Swiss playwright Max Frisch first wrote what would become The Arsonists as a radio play in 1953, in direct response to the culture of appeasement that made possible the Nazi rise to power and the 1948 Communist coup in Czechoslovakia. Sixty years later, Bay Area director Mark Jackson has tried his hand at dusting off the old play with a new translation by Alistair Beaton. Unfortunately, it still feels dusty. 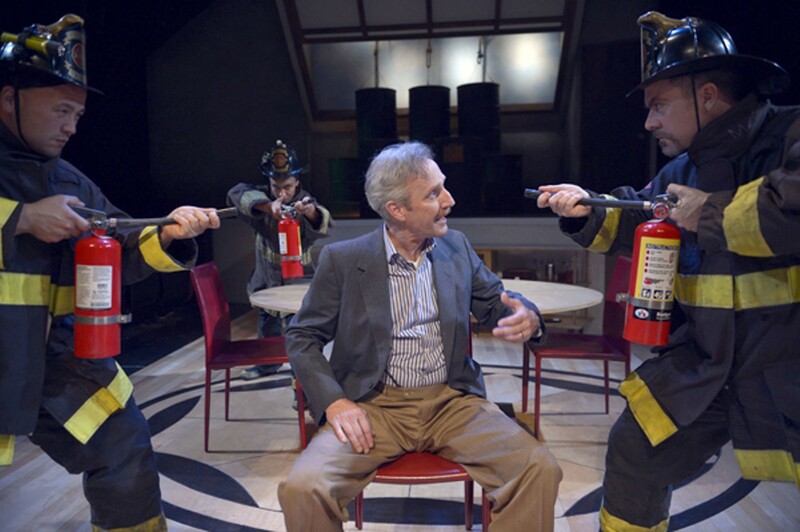 Taking the form of a parable that is essentially a farce, marbled with streaks of tragedy and moral inquiry, The Arsonists concerns a cowardly bourgeois couple, Biedermann (Dan Hiatt) and his wife Babette (Gwen Loeb), who shelter two serial arsonists, Schmitz (Michael Ray Wisely) and Eisenring (Tim Kniffin), because they are too scared to refuse — or to be seen as lacking in liberal goodwill. By effectively allowing the ingratiating evil-doers to carry out their plot, they put their whole town in jeopardy. 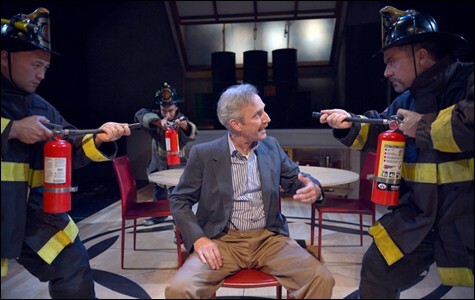 This plot allows Frisch, who was an outspoken individualist and realist, to rail against all parties involved, from the state — personified here by the chorus, an omnipresent group of robotic watchdog firefighters who, "always watching, never assuming the worst," ultimately allow the worst to occur — to the philosophy professor who removes himself from the immediacy of the situation by viewing things only in the abstract. The viewpoint feels right at home in 1953. Aurora Theatre Company's attempt to shuttle this idea into the present is awkward, and it does not arrive intact. On a superficial level, the renovation is raggedly selective: signifiers of Frisch's middle 20th century, from Biedermann's smoking jacket and finger bowls to the Orwellian fire brigade reciting its principles in unison, clash against modern items like a Nieman Marcus bag and a Cal Shakes reference. The Bay Area theater nod arrives during one of several breakings of the fourth wall, each of which intensifies the feeling of disjuncture between Frisch's world and ours. In one such instance, which attempts to serve Frisch's demand for direct moral engagement, Biedermann turns to the audience and frankly asks what we would have done in his shoes. The gesture is either pedantic (translating to "what should I have done," like one would address a Sunday school class) or provocative. If the latter, it hardly feels appropriate to answer; after all, Frisch explicitly intended the world on stage to refer to his own time with its own enemies, and the injection of modern department stores and a Don DeLillo reference does little to alter that fact. To try to cram a modern Other into the mold of Frisch's arsonists, if that is what this hypothetical inquiry is suggesting, could be very dangerous. What remains of this modern Arsonists, then, is either a generic condemnation of appeasement in the abstract or a banal comedy about a wealthy couple succumbing to destructive house guests. The production offers a few peculiar moments to pique the audience's imagination — for example the ominous, silent arrival of the widow of Bidermann's ex-partner, who commits suicide at Biedermann's suggestion — but the overall result is drab, played out on an equally drab set that livens up only at the explosive finale. Nothing could be further from Jackson's last production at Aurora, the fantastically wild and whirling ­­Salomania. The auteur director should focus his energies toward more plays like that one — historically situated (it revolved around the famous trial involving dancer Maud Allan) but suited for today. As for The Arsonists, if there is one thing that Jackson should make a point of holding onto for the future, it is Kniffin. The actor, with his impeccable timing and penchant for slick smarm, at least keeps The Arsonists funny.